The National Sustainable Agriculture Coalition (NSAC) is one of NOFA’s oldest alliances. With an expanding membership currently at 130 organizations from all around the country, an energetic and seasoned staff, and offices just a stone’s throw from the legislative office buildings on Capitol Hill – NSAC is well-positioned to advocate for the many-faceted interests of grassroots sustainable agriculture and organic groups at the House, Senate and government agencies. NSAC was founded in 2009 via a merger of the Sustainable Agriculture Coalition and the National Campaign for Sustainable Agriculture that were earlier attempts to create effective policy alliances of rural grassroots organizations to meet the farm crises of the late 1970’s and 1980’s. When repeated tractorcades to DC involving thousands of farmers failed to persuade the Federal government to maintain the policy of “parity” (government supported fair pricing for farm products that covered the costs of production), farmers and their allies turned to organizing for sustainability. If the government would not support farm gate prices by setting price minimums and managing supply, perhaps there could be payments to farms to practice conservation and to rural communities for development. Active in ag policy since the late 70’s, Ferd Hoefner headed up many of these early organizing efforts and then came on board as the first NSAC Policy Director. Over the years these efforts have brought about some major accomplishments including the Sustainable Agriculture Research and Education (SARE) Program, the Conservation Stewardship Program, the Value-Added Producer Grants Program, the National Organic Certification Cost Share, the Beginning Farmer and Rancher Development Program, the Wetlands Reserve Program and the Farmers’ Market Promotion Program. However, it is a testimony to the political severity of today’s times that many of these hard-won sustainable agriculture reforms and advances are now on the chopping block via back-room machinations in the upcoming 2018 Farm Bill – with some important long term conservation programs slated to be completely zeroed out. More on this in a moment. In addition to addressing such issues as food safety legislation and climate change, much of NSAC’s efforts are directed toward the multiple phases of the Farm Bills which authorize programs and the annual Appropriations process which fund them. Although this farm, food and rural development legislation must be reauthorized every four to five years by Congress, continuing work goes into formulating proposals, getting bipartisan support for old programs and new marker bills (legislative language proposals) ahead of time, developing a Farm Bill platform and orchestrating coalition advocacy efforts for their inclusion. Then, once the House and Senate versions are merged in conference and the Farm Bill is passed on the floor by Congress, continuing vigilance is required to ensure success during the following multi-year program implementation and funding process. Even though the finalized Farm Bill programs are authorized with mandatory or discretionary funding – the actual money must be authorized through Congressional Appropriations committees and are subject to the annual budget process which requires another whole set of outreach and advocacy efforts. The Farm Bill is organized into ag-related Titles such as commodities, conservation, trade, research and rural development as well as nutrition which includes the food stamp or Supplemental Nutrition Assistance Program (SNAP) which was initially authorized in 1964 to give urban lawmakers a stake in the farm-based legislative process. For this current 2018 Farm Bill, the SNAP program ranks high on the hit list for the Republican majority causing a large rift in a normally more bipartisan process. A Democrat strategy to counter these dealings is emerging to delay the 2018 Farm Bill past the September 30th deadline until after the November elections. Because of increasing citizen unrest over the direction of our government, strategists are gambling on a major shift in the constituency of the House and Senate. Partisan battle delays that have occurred with past Farm Bills are acutely problematic, however, because the smaller “tiny but mighty” programs below a $50 million baseline cut-off become suspended and are stranded without funding until a new Farm Bill is finally passed. Organic initiatives were orphaned in this situation when Congress failed to pass the 2012 Farm Bill – which wasn’t authorized until 2014. As you might expect, developing annual policy priorities for 130 diverse member organizations in 50 states – and raising the funds to take them on – is quite an undertaking. Over the years NSAC has evolved an effective process grounded on the work of six issue committees (some with active sub-committees) that meet at least monthly by conference call and then face-to-face twice annually at the Winter and Summer meetings held at various member locations all around the country. Research, Education and Extension (REE) focuses on USDA and other public agricultural research and extension programs as well as the Sustainable Agriculture Research and Education Program (SARE). Marketing, Food Systems, and Rural Development Committee (MFSRD) explores value-added marketing channels for sustainably-produced farm goods as well as economic strategies that build the vitality and sustainability of rural communities. Conservation, Energy, and Environment (CEE) helps formulate policy options and positions on a broad array of agricultural conservation programs, renewable energy policy, and environmental policy issues. Farming Opportunities and Fair Competition (FOFC) aims to improve market conditions for farmers by advocating for commodity program reform, farm credit, and beginning farmer and rancher provisions, among others. Food System Integrity (FSI) develops and advances policies that ensure a safe food supply and support for family farms, healthy food systems, and opportunities for sustainable farmers. Diversity (part of the Grassroots Council) incorporates and assesses social justice and diversity as operational elements of NSAC’s activities, including in the Organizational Council, Policy Council, Issue Committees, any ad hoc committees, and other operations of NSAC. Additionally, the Diversity Committee works to incorporate and assess social justice and diversity concerns within NSAC’s policy priorities, advocacy strategies, communications, and all other NSAC approved or supported activities, by making recommendations to appropriate council or committee. The heart of member involvement is through the regularly scheduled monthly committee conference calls. Continuity is provided with live notes taken by paid interns. Committee members develop and carry out their policy and appropriations agendas over the course of the year beginning with a multi-month priority setting process that gets underway in the fall. Starting with a detailed survey, members are asked to rank their priorities for each Committee they serve on. Based on these results each Committee then goes through an elaborate proposal process ranking Campaign Level, Second Tier, Backburner and Sign-On/Support categories for both Policy and Appropriations Issues. At the Winter Meeting these finalized Committee recommendations are presented to the Policy Council which is made up of Representative (as opposed to Participating) NSAC members who proceed via a series of votes to merge, approve and launch the overall NSAC priorities for the year. 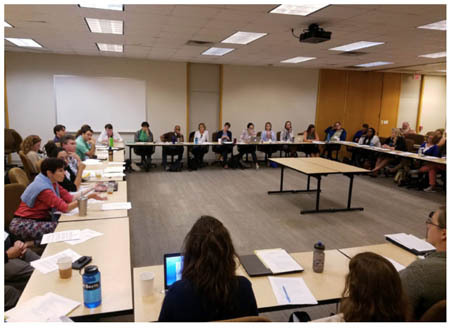 The Summer Meetings feature in-depth plenary sessions and committee meetings devoted to strategizing the coalition’s policy and grassroots priorities for the year. Also featured at each year’s far-flung location are meetings with local producers and on-farm visits with a hosted outdoor regional food dinner. As this is a Farm Bill year, for 2018 the Winter Meeting was in Washington DC with the Summer Meeting coming up this August in the Seattle area. Adding to NSAC’s membership representation functions, there is a Grassroots Council that is responsible for NSAC’s communications and advocacy coordination functions. Meeting frequently by conference call, members are responsible for developing strategies for grassroots advocacy campaigns, capacity building, NSAC member training, and leadership development. The Council also undertakes coordination of action alerts, media messaging, and promoting diversity throughout NSAC’s work with outreach, training, and other activities. The Grassroots Council is expanding their effectiveness on the ground by hiring Regional Organizers to work closely with coalition organizations. Ariana Taylor-Stanley from the Ithaca, NY area is the new Northeast Organizer – working closely with the NOFA states at the Retreat and Conferences. At the apex of the NSAC management pyramid is the Organizational Council that governs the affairs of NSAC. Along with the Managing Director, the Organizational Council establishes the NSAC mission, oversees strategic planning and development, evaluates NSAC’s effectiveness, and provides financial oversight and approval of the annual budget. The Organizational Council also approves membership applications to NSAC. Nominated and elected by both Represented and Participating Members, members of the Organizational Council serve two-year terms and meet at least bi-monthly. Staffwise, NSAC has a dynamic 14 person workforce that includes policy, grassroots, development and operations specialists. Paid internships are extremely competitive. In a leadership shift in 2016 appropriations expert Greg Fogel was elevated to the NSAC Policy Director position while the founding NSAC Director, Ferd Hoefner, working in a leadership role for over 30 years, has moved to the role of Senior Staff Advisor serving in an active mentoring and advisory role to the coalition. There’s no question that NSAC has evolved an extremely effective membership-based policy advocacy vehicle, guided and carried out by an expert staff. That this Administration and current Congress are presenting an enormous challenge to the broader grassroots sustainable agriculture/organic agenda is a major understatement, however. NSAC’s many legislative accomplishments over the years, as well as new proposals are now being specifically targeted for cuts or eradication. It’s plain that the way forward is to rally the growing citizen unrest to overturn the present regime and bring back a representative government while NSAC fulfills a critical role on Capitol Hill reforming federal food and agricultural policy and advancing a fair and just food system.